The Democratic Front, an alliance of five anti-Gorkha Janmukti Morcha parties, today demanded the arrest of Bimal Gurung in the Madan Tamang murder case and requested the governor to ask the state to "use its wisdom" regarding providing security and a red beacon to the GTA chief executive. A seven-member delegation of the front led by convenor Pratap Khati met governor Keshari Nath Tripathi at the Raj Bhavan here this morning. According to Khati, they told the governor that the CBI should not wait for the court's order. "Why should Bimal Gurung be treated differently? Because he is the chief of the GTA? He should be treated as any other murder accused as his name figures in the chargesheet. He should be arrested immediately and the CBI should not wait for the court's direction. There is a possibility of him influencing witnesses," Khati said . "We want the state to use its wisdom on the issue of providing security cover and a vehicle fitted with a red beacon to Bimal Gurung." Tamang's wife Bharati was also part of the delegation. Gurung, who has been named in the CBI chargesheet as an accused in the Madan Tamang murder case, enjoys a rank equivalent to a cabinet minister. He is entitled to a police convoy and allowed to have a red beacon on his official car. The CID and the CBI have named 54 people in their chargesheets. Of them, 23 were named in the CBI chargesheet in Calcutta on Friday. The list included almost all the top rung leaders of the Morcha. Khati, the general secretary of the Akhil Bharatiya Gorkha League of which Madan Tamang was the chief said: "We fear that few of the witnesses might have been bought over." On Monday, the city sessions court of Calcutta had directed the CBI not to proceed against any of the accused. The investigating officer has been asked to appear on June 6. The Raj Bhavan has not issued any statement regarding today's meeting. Tamang was hacked to death in Darjeeling on May 21, 2010. Today, the Democratic Front, which was formed yesterday by the ABGL, GNLF, CPRM, CPM and Sikkim-Darjeeling Ekikaran Manch, submitted a memorandum to the governor regarding the matter. 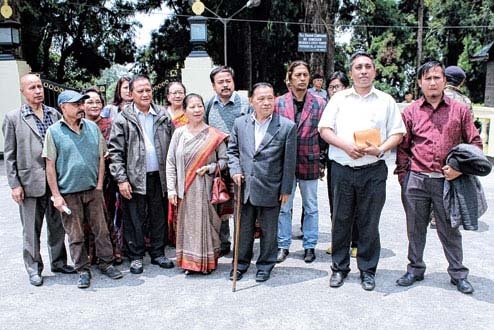 "The murderers, starting with the top echelon of the Gorkha Janmukti Morcha, have now been identified and arraigned by the investigation that culminated with the submission of the supplementary chargesheet by the CBI to the concerned court. However, we regret to note that the state has permitted them to roam around with impunity after their indictment and even today, we are yet to see a single warrant issued for their arrest," the memorandum reads. Khati said after the meeting: "The governor gave us a patient hearing and said the memorandum would be forwarded to the home ministry." The front also demanded that the Morcha should not be allowed to hold public meetings and rallies, "until the disposal of the trial for the murder" as it feared that the leadership would issue threats in public.